Patients must receive further care to determine the response to patient education and speech therapy and to assess the need for referral for psychiatric care. Many patients with vocal cord dysfunction (VCD) are treated inappropriately with corticosteroids if they present to an emergency department or acute care facility even after the diagnosis of VCD is established. A handout (see below) for the patient to show to new physicians may be helpful to avoid inappropriate treatment. Vocal cord dysfunction treatment plan. Deterrence and prevention can be achieved by adherence to speech therapy guidelines and exercises and by relaxation therapy or other measures to decrease anxiety. Prognosis is good with effective response to speech therapy, which allows patients to take control of their disorder. Patient education ideally uses a multidisciplinary approach with involvement of a physician and speech therapist and, if needed, a psychiatrist. The physician's role is to inform the patient of test findings, especially the absence of diseases such as asthma, and to explain the nature of the condition. Patients often express a positive reaction to the initial explanation, and such a reaction usually implies a good prognosis. Anbar RD, Hehir DA. Hypnosis as a diagnostic modality for vocal cord dysfunction. Pediatrics. 2000 Dec. 106(6):E81. [Medline]. Bahrainwala AH, Simon MR. Wheezing and vocal cord dysfunction mimicking asthma. Curr Opin Pulm Med. 2001 Jan. 7(1):8-13. [Medline]. Huggins JT, Kaplan A, Martin-Harris B, Sahn SA. Eucalyptus as a specific irritant causing vocal cord dysfunction. Ann Allergy Asthma Immunol. 2004 Sep. 93(3):299-303. [Medline]. Byrd RP Jr, Krishnaswamy G, Roy TM. Difficult-to-manage asthma. How to pinpoint the exacerbating factors. Postgrad Med. 2000 Nov. 108(6):37-40, 45-6, 49-50 passim. [Medline]. Hayes JP, Nolan MT, Brennan N, FitzGerald MX. Three cases of paradoxical vocal cord adduction followed up over a 10- year period. Chest. 1993 Sep. 104(3):678-80. [Medline]. Vlahakis NE, Patel AM, Maragos NE, Beck KC. Diagnosis of vocal cord dysfunction: the utility of spirometry and plethysmography. Chest. 2002 Dec. 122(6):2246-9. [Medline]. Christopher KL, Wood RP 2nd, Eckert RC, et al. Vocal-cord dysfunction presenting as asthma. N Engl J Med. 1983 Jun 30. 308(26):1566-70. [Medline]. Hicks M, Brugman SM, Katial R. Vocal cord dysfunction/paradoxical vocal fold motion. Prim Care. 2008 Mar. 35(1):81-103, vii. [Medline]. Galdi E, Perfetti L, Pagella F, et al. Irritant vocal cord dysfunction at first misdiagnosed as reactive airway dysfunction syndrome. Scand J Work Environ Health. 2005 Jun. 31(3):224-6. [Medline]. Goldman J, Muers M. Vocal cord dysfunction and wheezing. Thorax. 1991 Jun. 46(6):401-4. [Medline]. Silvers WS, Levine JS, Poole JA, et al. Inlet patch of gastric mucosa in upper esophagus causing chronic cough and vocal cord dysfunction. Ann Allergy Asthma Immunol. 2006 Jan. 96(1):112-5. [Medline]. Husein OF, Husein TN, Gardner R, et al. Formal psychological testing in patients with paradoxical vocal fold dysfunction. Laryngoscope. 2008 Apr. 118(4):740-7. [Medline]. Christopher KL, Morris MJ. Vocal cord dysfunction, paradoxic vocal fold motion, or laryngomalacia? Our understanding requires an interdisciplinary approach. Otolaryngol Clin North Am. 2010 Feb. 43(1):43-66, viii. [Medline]. Freedman MR, Rosenberg SJ, Schmaling KB. Childhood sexual abuse in patients with paradoxical vocal cord dysfunction. J Nerv Ment Dis. 1991 May. 179(5):295-8. [Medline]. McFadden ER Jr, Zawadski DK. Vocal cord dysfunction masquerading as exercise-induced asthma. a physiologic cause for "choking" during athletic activities. Am J Respir Crit Care Med. 1996 Mar. 153(3):942-7. [Medline]. Morris MJ, Deal LE, Bean DR, et al. Vocal cord dysfunction in patients with exertional dyspnea. Chest. 1999 Dec. 116(6):1676-82. [Medline]. Wilson JJ, Theis SM, Wilson EM. Evaluation and management of vocal cord dysfunction in the athlete. Curr Sports Med Rep. 2009 Mar-Apr. 8(2):65-70. [Medline]. Al-Alwan A, Kaminsky D. Vocal cord dysfunction in athletes: clinical presentation and review of the literature. Phys Sportsmed. 2012 May. 40(2):22-7. [Medline]. Rundell KW, Weiss P. Exercise-induced bronchoconstriction and vocal cord dysfunction: two sides of the same coin?. Curr Sports Med Rep. 2013 Jan. 12(1):41-6. [Medline]. Allan PF, Abouchahine S, Harvis L, Morris MJ. Progressive vocal cord dysfunction subsequent to a chlorine gas exposure. J Voice. 2006 Jun. 20(2):291-6. [Medline]. Morris MJ, Christopher KL. Diagnostic criteria for the classification of vocal cord dysfunction. Chest. 2010 Nov. 138(5):1213-23. [Medline]. Bittleman DB, Smith RJ, Weiler JM. Abnormal movement of the arytenoid region during exercise presenting as exercise-induced asthma in an adolescent athlete. Chest. 1994 Aug. 106(2):615-6. [Medline]. Watson MA, King CS, Holley AB, Greenburg DL, Mikita JA. Clinical and lung-function variables associated with vocal cord dysfunction. Respir Care. 2009 Apr. 54(4):467-73. [Medline]. 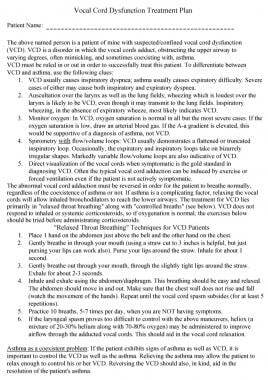 Balkissoon R, Kenn K. Asthma: vocal cord dysfunction (VCD) and other dysfunctional breathing disorders. Semin Respir Crit Care Med. 2012 Dec. 33(6):595-605. [Medline]. Traister RS, Fajt ML, Landsittel D, Petrov AA. A novel scoring system to distinguish vocal cord dysfunction from asthma. J Allergy Clin Immunol Pract. 2014 Jan-Feb. 2(1):65-9. [Medline]. Chiang WC, Goh A, Ho L, Tang JP, Chay OM. Paradoxical vocal cord dysfunction: when a wheeze is not asthma. Singapore Med J. 2008 Apr. 49(4):e110-2. [Medline]. Newman KB, Mason UG 3rd, Schmaling KB. Clinical features of vocal cord dysfunction. Am J Respir Crit Care Med. 1995 Oct. 152(4 Pt 1):1382-6. [Medline]. Deckert J, Deckert L. Vocal cord dysfunction. Am Fam Physician. 2010 Jan 15. 81(2):156-9. [Medline]. Doshi DR, Weinberger MM. Long-term outcome of vocal cord dysfunction. Ann Allergy Asthma Immunol. 2006 Jun. 96(6):794-9. [Medline]. Guglani L, Atkinson S, Hosanagar A, Guglani L. A systematic review of psychological interventions for adult and pediatric patients with vocal cord dysfunction. Front Pediatr. 2014. 2:82. [Medline]. [Full Text]. Kass JE, Castriotta RJ. Heliox therapy in acute severe asthma. Chest. 1995 Mar. 107(3):757-60. [Medline]. Manthous CA, Hall JB, Caputo MA, et al. Heliox improves pulsus paradoxus and peak expiratory flow in nonintubated patients with severe asthma. Am J Respir Crit Care Med. 1995 Feb. 151(2 Pt 1):310-4. [Medline]. Grillone GA, Blitzer A, Brin MF, et al. Treatment of adductor laryngeal breathing dystonia with botulinum toxin type A. Laryngoscope. 1994 Jan. 104(1 Pt 1):30-2. [Medline]. Maillard I, Schweizer V, Broccard A, et al. Use of botulinum toxin type A to avoid tracheal intubation or tracheostomy in severe paradoxical vocal cord movement. Chest. 2000 Sep. 118(3):874-7. [Medline]. Dworkin JP, Meleca RJ, Simpson ML, Garfield I. Use of topical lidocaine in the treatment of muscle tension dysphonia. J Voice. 2000 Dec. 14(4):567-74. [Medline]. Parsons JP, Benninger C, Hawley MP, Philips G, Forrest LA, Mastronarde JG. Vocal cord dysfunction: beyond severe asthma. Respir Med. 2010 Apr. 104(4):504-9. [Medline]. Woolnough K, Blakey J, Pargeter N, Mansur A. Acid suppression does not reduce symptoms from vocal cord dysfunction, where gastro-laryngeal reflux is a known trigger. Respirology. 2013 Apr. 18(3):553-4. [Medline]. Bahrainwala AH, Simon MR, Harrison DD, et al. Atypical expiratory flow volume curve in an asthmatic patient with vocal cord dysfunction. Ann Allergy Asthma Immunol. 2001 Apr. 86(4):439-43. [Medline]. Brancatisano T, Collett PW, Engel LA. Respiratory movements of the vocal cords. J Appl Physiol. 1983 May. 54(5):1269-76. [Medline]. Diamond E, Kane C, Dugan G. Presentation and Evaluation of Vocal Cord Dysfunction. Chest. 2000. 118(Suppl 4):199S. Higgins JC. The 'crashing asthmatic.'. Am Fam Physician. 2003 Mar 1. 67(5):997-1004. [Medline]. Jain S, Bandi V, Zimmerman J, et al. Incidence of Vocal Cord Dysfunction in Patients Presenting to Emergency Room with Acute Asthma Exacerbation. Chest. 1999. 116(Suppl 4):243S. Landwehr LP, Wood RP 2nd, Blager FB, Milgrom H. Vocal cord dysfunction mimicking exercise-induced bronchospasm in adolescents. Pediatrics. 1996 Nov. 98(5):971-4. [Medline]. Link HW, Stillwell PC, Jensen VK, Laskowski DM. Vocal Cord Dysfunction in the Pediatric Age Group. Chest. 1998. 114(Suppl 4):255S-256S. Martin R, Blager F, Gay M, et al. Paradoxical vocal cord motion in presumed asthmatics. Semin Respir Med. 1987. 8:332-337. Maschka DA, Bauman NM, McCray PB Jr, et al. A classification scheme for paradoxical vocal cord motion. Laryngoscope. 1997 Nov. 107(11 Pt 1):1429-35. [Medline]. McFadden ER Jr. Glottic function and dysfunction. J Allergy Clin Immunol. 1987 May. 79(5):707-10. [Medline]. Murray DM, Lawler PG. All that wheezes is not asthma. Paradoxical vocal cord movement presenting as severe acute asthma requiring ventilatory support. Anaesthesia. 1998 Oct. 53(10):1006-11. [Medline]. Newman KB, Dubester SN. Vocal Cord Dysfunction: Masquerader of Asthma. Semin Resp Crit Care Med. 1994. 15:161-167. O'Connell MA, Sklarew PR, Goodman DL. Spectrum of presentation of paradoxical vocal cord motion in ambulatory patients. Ann Allergy Asthma Immunol. 1995 Apr. 74(4):341-4. [Medline]. O'Hollaren MT. Masqueraders in clinical allergy: laryngeal dysfunction causing dyspnea. Ann Allergy. 1990 Nov. 65(5):351-6. [Medline]. Paparella MM, Shumrick D, Gluckman J, Meyerhoff W. Otolaryngology: Head & Neck. 3rd ed. Philadelphia, Pa: WB Saunders Co; 1991. Parker JM, Mooney LD, Berg BW. Exercise Tidal Loops in Patients with Vocal Cord Dysfunction. Chest. 1998. 114(Suppl 4):256S. Patterson DL, O'Connell EJ. Vocal Cord Dysfunction: What have we learned in 150 years?. Insights in Allergy. 1994. 9(6):1-12. Perkner JJ, Fennelly KP, Balkissoon R, et al. Irritant-associated vocal cord dysfunction. J Occup Environ Med. 1998 Feb. 40(2):136-43. [Medline]. Powell DM, Karanfilov BI, Beechler KB, et al. Paradoxical vocal cord dysfunction in juveniles. Arch Otolaryngol Head Neck Surg. 2000 Jan. 126(1):29-34. [Medline]. Reisner C, Nelson HS. Vocal cord dysfunction with nocturnal awakening. J Allergy Clin Immunol. 1997 Jun. 99(6 Pt 1):843-6. [Medline]. Sandage MJ, Zelazny SK. Paradoxical vocal fold motion in children and adolescents. Lang Speech Hear Serv Sch. 2004 Oct. 35(4):353-62. [Medline]. Schachter AJ. Vocal cord dysfunction may be functional. Chest. 1998 Jul. 114(1):351. [Medline]. Selner JC, Staudenmayer H, Koepke JW, et al. Vocal cord dysfunction: the importance of psychologic factors and provocation challenge testing. J Allergy Clin Immunol. 1987 May. 79(5):726-33. [Medline]. Sokol W. Vocal cord dysfunction presenting as asthma. West J Med. 1993 Jun. 158(6):614-5. [Medline]. Soli CG, Smally AJ. Vocal cord dysfunction: an uncommon cause of stridor. J Emerg Med. 2005 Jan. 28(1):31-3. [Medline]. Weir M, Ehl L. Vocal cord dysfunction mimicking exercise-induced bronchospasm in adolescents. Pediatrics. 1997 Jun. 99(6):923-4. [Medline]. Wood RP 2nd, Milgrom H. Vocal cord dysfunction. J Allergy Clin Immunol. 1996 Sep. 98(3):481-5. [Medline]. Bucca C, Rolla G, Brussino L, De Rose V, Bugiani M. Are asthma-like symptoms due to bronchial or extrathoracic airway dysfunction?. Lancet. 1995 Sep 23. 346 (8978):791-5. [Medline]. CC Maskell, N Pargeter, J Fellows, A Mansur, R Howard. M11 A preliminary biopsychosocial model of Vocal Cord Dysfunction (VCD). Thorax. 2015. 70:A231-A232. Hicks M, Brugman SM, Katial R. Vocal cord dysfunction/paradoxical vocal fold motion. Prim Care. 2008 Mar. 35 (1):81-103, vii. [Medline]. Morrison M, Rammage L, Emami AJ. The irritable larynx syndrome. J Voice. 1999 Sep. 13 (3):447-55. [Medline]. Traister RS, Fajt ML, Petrov AA. The morbidity and cost of vocal cord dysfunction misdiagnosed as asthma. Allergy Asthma Proc. 2016 Mar. 37 (2):25-31. [Medline]. Laryngoscopic views of the vocal cords.